Ever dreamed of watching your two favorite zombie series on the big screen? Now you can! Fathom Events has just announced an exciting deal that will bring Rick, Michonne and Negan to battle like never seen before. And it sounds pretty exciting, as tickets for this The Walking Dead and Fear the Walking Dead big screen crossover event go on sale very soon. Fans of The Walking Dead universe can now experience their favorite post-apocalyptic world on the big screen as Fathom Events and AMC announced today Survival Sunday: The Walking Dead & Fear the Walking Dead, a one-night fan event on April 15. 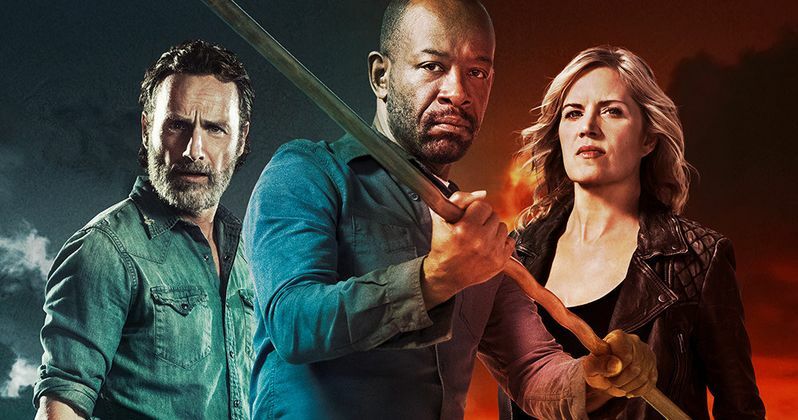 Celebrating the highly-anticipated series crossover, The Walking Dead Season 8 finale and the Fear the Walking Dead Season 4 premiere will be screened commercial-free in more than 750 select movie theaters nationwide. The cinema event will also feature exclusive bonus content to be announced in the coming weeks. Tickets for Survival Sunday: The Walking Dead & Fear the Walking Dead can be purchased beginning Friday, March 16 at www.FathomEvents.com or participating theater box offices. Members of TWD Fan Rewards Club can purchase their tickets starting Thursday, March 15 at www.TWDRewards.com and earn points for their fandom. The screening event begins live at 8:30 p.m. ET / 7:30 p.m. CT / 6:30 p.m. MT / 5:30 p.m. PT (and tape-delayed to 7:30 p.m. AK and 6:30 p.m. HI) through Fathom's Digital Broadcast Network (DBN). For a complete list of theater locations, visit the Fathom Events website (theaters and participants are subject to change). Sunday, April 15 marks an epic and highly-anticipated moment for these zombie series, as worlds collide when Morgan crosses over from The Walking Dead and into the new world of Fear,' said Theresa Beyer, SVP of Brand Activation for AMC. "We are thrilled to be working with our terrific partners at Fathom to provide fans from across the country the opportunity to experience this crossover moment in such a special way and among other members of one of television's most passionate fan communities." Fathom Events CEO Ray Nutt said this. "The Walking Dead and Fear the Walking Dead have captivated audiences and kept them on the edge of their seats for many years. Self-proclaimed 'Dead-heads' will have the unique opportunity to come together to experience these two compelling dramas larger-than-life and commercial-free on the big screen for just one night this April." Produced by AMC Studios, The Walking Dead and Fear the Walking Dead are the #1 and #4 dramas on cable, respectively, among adults 18-49 and adults 25-54 in Nielson live+3 ratings. Walking Dead Movie May Happen, But Do Fans Care at This Point?